You can continue right along following the installation instructions for your theme. There are no adverse affects on the theme if there were import errors. If you want a detailed explanation about why this happens and some additional information, keep reading. First, it's incredibly common. 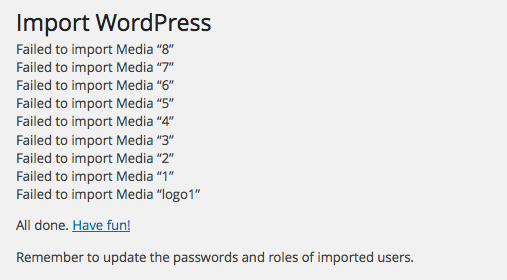 The WordPress Importer plugin can be very finicky and most of the time, images will not import into your Media Library. Because of this, you'll often have a long list of "failed imports." This is simply telling you that the images were not loaded into your Media Library. This is not a problem — see next point. Though the images may not have loaded in your Media Library, the images will always appear in the posts themselves because they are hard-linked to the demo site. Once you have imported the demo content, you can visit the demo posts on your site and all of the images will be there. If you are receiving the page shown in the screenshot at the top of this article, that means your content was in fact imported — including posts, pages, menus, portfolio items, and WooCommerce products if applicable. Do not try to reimport the demo content file. If you import again, you can end up with duplicate content, which will just complicate your theme setup. If WooCommerce is not installed when you install the demo posts, you will receive several product import errors. Nothing to worry about there. Even if you want to use WooCommerce later on, having the demo products imported does not matter. If your theme uses featured images prominently, we recommend that you add featured images to the demo posts so everything will look right in your theme. Click here for instructions on adding featured images to your posts. (Please note that the "tip" at the bottom of the Featured Image tutorial will not apply here, since the images are not in your own Media Library).